Love doesn’t mean never being angry. Being in a relationship with another human being takes us on a journey of emotional exploration that runs the entire spectrum over time. In short, there will be times when you are angry, perhaps even livid, with each other. Perhaps not often, but eventually this is going to happen. Being super mad at someone else sure doesn’t feel much like love, but it is part of the ride. So, how do you handle the big, ugly, negative feelings without injuring the other person and damaging your relationship beyond repair? This brings me to the ultimate advice on what not to say when you are angry. 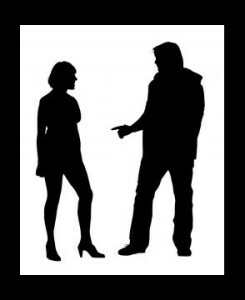 There are many things to avoid saying, but the one thing you must never say in anger is “I’m leaving you.” This sentence comes in many forms…including worlds like “breaking up” or “divorce” or “ending it” or “moving on” or any other combination that means the same thing. Did you know that fear of abandonment/rejection ranks within the top three fears of all human beings? There is a very good reason for that. Human beings need other human beings for survival; from infancy throughout their lifespan. There is no documented case of a human being placed in isolation that survived alone over an extended period of time without going insane. This is why being put in isolation is used as a punishment in prison (it is bigger than the punishment of being in prison to start with!). When a person in a relationship pulls the “break up” or “divorce” card, it changes the very foundation of the union. Security and trust take a big blow and trust is the primary foundation of strong relationships. Crack your trust foundation deep enough and you may never get the chance to get it back. Count to ten. Most of us have heard this before, but the darn thing works more often than not. Take a ride in the 10 minute time machine. This is a great tool I used with many clients to help them choose a response to a situation rather than get caught up in the reaction. The way it works is you imagine yourself 10 minutes into the future. You ask yourself “what do I want to remember myself saying or doing in this moment, ten minutes from now?”. If screaming “we are OVER!” is what you truly want to do, then be prepared for an actual ending. Now, if after you have had a cooling off period you are still feeling like this relationship is over, then it very well might be, but make sure the emotions have settled down and you are making clear decisions before throwing out words that wound.